This is the review for last week’s Chris Words puzzle, “THAT’S THE POWER OF LOVE“. I actually wrote the review last weekend, but held off on posting until now since it’s a meta. If all goes well, this should be showing up on Saturday, with another new puzzle out tomorrow. Anyway, spoilers below. Chris King is an indie constructor who’s actually been posting free puzzles for quite a while now, but I’m not that familiar with his work, possibly because he doesn’t seem to construct for mainstream outlets much (if at all). I’ve sampled his work here and there in the past, but this is the first meta of his that I’ve done. 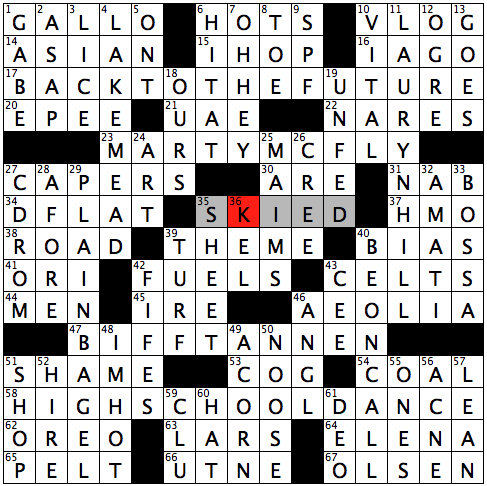 We’re looking for an appropriate eight-letter word that relates to this tribute puzzle. As I’ve learned from trying (and mostly failing) various metas, it’s worth keeping an eye out for any spots where the fill seems inexplicably strained, since that’s often an indication of a secret. In this case, the crossing of CLU (59D: Actor Gulager of “The Virginian”) and UTNE (66A: Alternative bimonthly magazine) is significantly harder than the rest of the puzzle, and AEOLIA (46A: Ancient Greek colony in modern Turkey whose namesake god also names a harp) is nasty enough to require two clues. I also got hung up on the SKIED (35A: Pizzaed and french fried, maybe) / KEL (36D: Nickelodeon character who loves orange soda) crossing at the centre — apparently the SKIED clue is a reference to a South Park episode, but I’ve barely watched that show. Had to run the alphabet for the crossing there. We’ll see if any of those spots turn out to be significant. My initial reaction is that there’s a very obvious 8-letter word connected to Back to the Future, which is “DeLorean”. So that would be a decent guess if I can’t crack this. Anyway, nothing immediately jumps out at me. HIGH SCHOOL DANCE is specific to the first movie, and both MARTY and BIFF are specifically clued in reference to the original, but that doesn’t get me anywhere. There also doesn’t seem to be any more specific link between the entries than the obvious — one is the title of the series, two are characters, and one is a setting/plot event. Since the date is obviously what inspired this puzzle, I wonder if the letters I need could be hidden in squares that contain the numbers in question: 10-21-2015. Eight digits = eight letters! But of course there’s no “zero” square. I could read it as four 2-digit numbers, which would give me… VUEI. Well, nothing there. I know from reading Joon Pahk’s meta writeups on Crossword Fiend that you should always look at the title. In this case, I immediately know the source: “Power of Love” was recorded by Huey Lewis and the News as a theme song for Back to the Future, and Marty’s band plays a hard-rock version of the song early in the film during a tryout for a Battle of the Bands (Huey has a cameo in that scene, incidentally). My mind is still on numbered squares, so I think about “love” in the tennis sense and look to see if there are any O’s in numbered squares in the grid — maybe I can take the numbers and use the standard alphanumeric cipher to turn them into the letters I need? And indeed, 5, 7 and 12 all contain O’s, but that’s it, and there are a lot more O’s in unnumbered squares. Too much of a stretch. Time to take a step back. There’s one element I haven’t considered yet, and that’s THEME, which is clued in reference to the HIGH SCHOOL DANCE. The theme of the dance in Back to the Future is “Enchantment Under the Sea”. Are there any answers that reference magic or water? I briefly get excited about LAKE MEAD, but that’s the only one I can find. Still, the theme seems like a promising direction. What if the letters I need are literally located “under the sea”? As in C, the letter? I count up the C’s in the grid, and hello! There are exactly 8, in BACK TO THE FUTURE, MARTY MCFLY, CAPERS, CELTS, COG, COAL and HIGH SCHOOL DANCE. And none of them are the terminal letters of Down answers, so they all have letters under them: specifically, E, R, D, E, O, A, L and N.
You’ve probably figured out where this is going, but I’m terrible at anagrams, so I plug them into an anagram website… and of course it spits out DeLorean, confirming my original guess. I noticed after the fact that the letters actually spell DeLorean if you read them from left to right instead of working through the grid left-to-right, top-to-bottom like I did. Nice touch! And this does indeed explain the CLU / UTNE and AEOLIA bits from earlier, since both of them include letters that have to be fixed in place. The tribute aspect of this puzzle doesn’t do much for me, since it’s ultimately just a straightforward list, and the fill is solid but not exceptional. I did like the clues on IHOP (15A: They make mad stacks, and by “mad”, I mean fluffy), COAL (54A: Hibachi or stocking filler) and HAT (60D: Article of clothing that turns Walter White into Heisenberg), but otherwise the clues could have used a little more personality for my taste. But the meta provided a nice “aha!” moment, and I like that it required actual knowledge of the movie to know the dance’s theme. Fun stuff. My love for the BTTF franchise knows no bounds, and the blog post tomorrow will reflect a lot of that. The meta trick to this puzzle was certainly a difficult task to handle, especially since 4 of the 8 Cs were predestined by theme answers. At the end of the day, I wanted to create a tribute puzzle that doubles into a meta, which I think I accomplished. Thanks Ben for reviewing this puzzle, and I hope you try some of my previous puzzles!